As with most churches, St James's was built with the altar end facing east towards the rising sun. The architect was W Wigginton of County Chambers, Cornhill and the contractors were Messrs Bond of Hackney. It was built in Gothic Revival style with the main walls of yellow stock brick and stone dressing around the corners and windows. The spire was made of stone and the roof of slate on a timber structure over the nave and chancel, apart from the two aisles which were covered with copper in 1963. The inside of the church has a feeling of warmth and welcoming, especially with the light coming through the beautiful stained glass windows. The spire above the tower rises up as a familiar and prominent local landmark. The church hall is a much used addition to the church and looks out over the churchyard next to the vicarage. There are various symbols in the carvings, embroideries and stained glass of the church and even outside the church. Have a look at some of these on the page Symbols in the church. A symbol is something that makes us think about something else. It is said that early Christians did not think it reverent to write the names of God or Jesus in full, so they made different symbols for them. 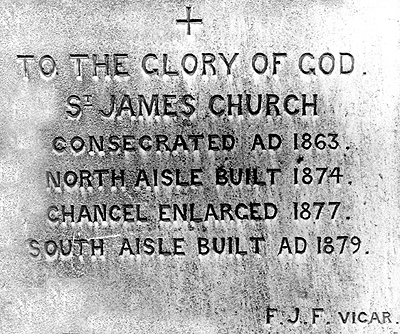 • The foundation stone, on the outside of the east wall, for the church was consecrated in 1863. • The pink granite foundation stone for the tower and spire, on the south side of the base of the tower, was laid by the vicar’s only son, Edward on the 20th of June 1887. One each of every coin in the country, from a farthing to a guinea, was placed behind this stone. 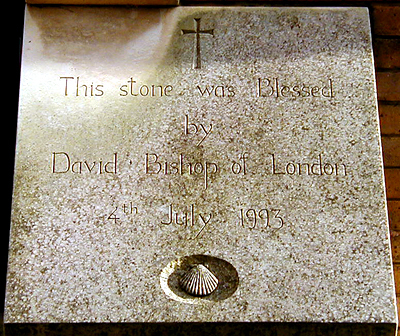 • The last foundation stone, that for the church hall, on the west side of the porch, was consecrated by the Bishop of London, David Hope, during the St James’s Festival on the 4th July, 1993.